In finalising the documentary “The Last Battle” (sequel to “The Doctor Who Refused To Give Up”), I am also reviewing how Wikipedia (infiltrated by ”Sceptics”), posts texts which are false and contain insinuations and slanders against Dr Erik Enby. After several suggestions to make a documentary about a doctor completely unknown to me, I searched for information but found nothing about him on Swedish Wikipedia. Then I found an article on google, where a well-known sceptic, Dan Larhammar, was highly critical of Dr Enby. I sought an interview with Mr Larhammar but he refused my request. Subsequently, I found an article about Dr Enby in English on Wikipedia. The text was sketchy, having been manipulated by sceptics from VoF, an organisation chaired at one time by Dan Larhammar. Most of the comments were attributable to senior figures within VoF. 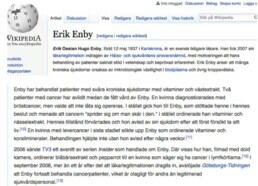 As a result, in the spring of 2015, I decided to write a factual article on Dr Enby for Swedish Wikipedia. Though very early in the morning, a well-known sceptic associated to Larhammar immediately reacted; I found that he had been assigned to lead the Wikipedia ‘‘guerilla attack’’ on Erik Enby. Even before I had got to know Erik Enby, I had reacted to the manner in which VoF steered Wikipedia and I published several articles about this. The massive VoF attack that my initiative triggered was nevertheless surprising. Gradually, it became clear that Dan Larhammar had initiated the entire campaign by VoF against Dr Enby. The current Swedish Wikipedia article (January, 2019) still contains content that can only be described as false and has been proven to be fabricated. Entries in an encyclopedia should not reflect any prejudice but adhere to fact. I would mention here the decline of standards in journalism, where Swedish daily papers (especially Expressen) played an almost criminal role in the media witch-hunt against Dr Enby, with over 15 journalists slandering Dr Enby on a regular basis for over 10 years. Looking at the current Wikipedia article on Erik Enby, it implies that using non-conventional methods is inappropriate, unapproved etc. In over 40 years of dealing with chronic diseases, Dr Enby has adopted a holistic approach to treatment. His research has shown that chronic diseases stem from various forms of microbiological growth which, unlike in healthy individuals, occur in the tissues and body fluids of the chronically ill. This includes those affected by cancer. His initial research project was approved in 1983 by the ethics committee of the Faculty of Medicine at the University of Gothenburg. Due to a lack of competent supervision, he did not receive the appropriate support, leading him to proceed with the project on his own. This angered some of his colleagues and particularly incensed Dan Larhammar, which subsequent correspondence from him confirms. Larhammar can also be credited for Dr Enby losing his licence to practise. Larhammar even scared away researchers who had shown interest in Dr Enby’s studies and were prepared to be interviewed for the documentary. This is a serious breach of the principle of freedom of speech. This text implies that the use vitamins and plant extracts has little medical value. However, vitamins are essential for health and nature provides the base for medicine. The Chinese researcher Tu Youyou was awarded the 2015 Nobel Prize in Medicine for her “discoveries regarding a new medicine against malaria” extracted from artemisia. This is based on traditional Chinese herbal medicine but which in Sweden is referred to as ‘‘alternative’’ and VoF sceptics continue to deprecate its value. That the Nobel Foundation still acknowledged Chinese natural medicine must have been a severe blow to Dan Larhammar, the current Third preses of the Swedish Academy of Science. The treatments Dr Enby uses have detoxifying (cleansing) effects. His empirical data from treating more than 30,000 patients over 40 years is sufficient to establish what is called ‘‘scientific and verifiable experience.’’ Research and studies by several Nobel prize-winners confirm Dr Enby’s methods. This text is based on accusations which, on the initiative by Dan Larhammar, led to Dr Enby losing his licence to practise medicine. A complaint was filed by the father of a woman who had had long-term cancer and who, in the summer of 2003, consulted Dr Enby twice and bought some medicines. A witness present at the consultation confirmed that Dr Enby had advised the patient to contact her doctor again and to undergo surgery. This is also noted in the patient’s records. This confirms that the claims in the Wikipedia article are based on fabrications. This key witness was never heard by the court as she did not support the complainant’s unsubstantiated allegations. The cancer patient had not wanted her angry father to blame or attack Dr Enby. She died a year after the consultation with Dr Enby and, according to her father, by her own hand. Yet the media blamed Dr Enby for her death. This defamation also influenced the decision to remove his licence. FACTS: It was over 14 months from the first sign of the tumour to the initial consultation with Dr Enby. Prior to this, the patient had been in contact with a total of nine hospital doctors, three private doctors and several therapists and had refused to go through with breast cancer surgery scheduled at Helsingborg’s Hospital. Dr Enby only met the patient twice and already by that time the cancer was well advanced. In the other case, Wikipedia also implies that Dr Enby is to blame. The cancer patient in this case received no treatment at the hospital, as she was considered beyond help. As a last resort, she consulted Dr Enby and purchased a course of medication. However, she died before starting the treatment and her daughter received a full refund for any unopened packages. This case was used as emotional propaganda to dramatically extend the media witch-hunt against Dr Enby, a campaign endorsed by Dan Larhammar in newspaper articles and on TV and radio. Dr Enby has never prescribed nettle extract, blueberry extract or horseradish in the treatment of patients. Again, there is factual error in the Wikipedia text, with the obvious intention to discredit Dr Enby. To conduct research on extracts and to prescribe them is totally different. The woman mentioned in the TV3 episode was subsequently interviewed by Börje Peratt and her testimony recorded. It shows that TV3 had put words in the woman’s mouth, directed her and then failed to report that Dr Enby had repeatedly said that he could not treat her as she could not provide her diagnosis or name the hospital she claimed had examined her. In fact, the woman now says that she was a victim of manipulation by TV3. The fact that Wikipedia does not refer to the correct name of the newspaper (GT) is perhaps not surprising, as this section is full of false claims. Dr Enby does not treat cancer but adopts a holistic approach, primarily treating the blood. This can provide the body with the opportunity to ‘‘repair’’ itself. Dr Enby’s successes with patients are well documented and some results could be regarded as extraordinary. The Gothenburg Police raided Dr Enby’s home on 4th December 2014, the result of combined abuse by the authorities and journalists on the Swedish Radio programme Body & Soul on 1st April 2014 This was initiated by Dan Larhammar. The series was subsequently dropped following an investigation by the Public Media Review Board. After almost 19 months of interviewing his patients, the prosecutor could not find any malpractice or violations by Dr Enby. Having failed to produce any evidence for prosecution, the preliminary investigation was terminated on 27th October 2015. In effect, the preliminary investigation acquitted Dr Enby; however, it nonetheless contributed to the continuing scandal waged against Erik Enby. Erik Enby has turned to various courts to get his medical licence back. The National Board of Health had applied to HSAN (the Swedish Health and Medical Services Board) to charge Dr Enby but by this stage, the statute of limitation had long since taken effect. This meant that Dr Enby could not have been liable for the offences that the National Board of Health and Welfare had alleged. Dr Enby’s case has now reached the Supreme Administrative Court. Among the reasons for re-opening the appeal is that the initial documentation is riddled with irregularities and characterised by confusion and corruption. The charge against Dr Enby was, as mentioned above, filed long after the limitation period had expired and is thus without legal authority and lacks validity. Any encyclopedia worthy of the name (Wikipedia) should review contributions rather than giving support to prejudice and personal (Larhammar’s) interests. Documentary Part 1 “The Doctor Who Refused To Give Up” has run national in Swedish Cinemas for over a year (2016-2017) and since many Swedish media was part of the persecution they have silenced reviews of the film. But the audience still came in large numbers and have given exquisit tributes also in alternative reviews. The following incidents has led to a Sequel. The Last Battle. The film has been financed through ‘crowdfunding’ (monies donated by sympathisers); this only covered a portion of the costs. Börje Peratt and his film team have taken a principled stand, donating their services to the value of over one million Swedish kronor. The crowdfunding was organised by Siv Wernborg, Gothenburg, who had previously been employed in the pharmaceutical industry. About fifteen years ago, Siv was diagnosed with malignant melanoma and the prognosis was that she had two months to live. In addition, surgery was required, involving the removal of half her face and probably one eye. She had heard of Erik Enby and resolved to promote Erik Enby’s methods if she recovered. She has recovered and kept her promise. In the prologue, Peratt made it clear that he, as a journalist, was open-minded and free from prejudice and expectation and that he wished to interview those who were opposed to Enby. One of the foremost of these, Professor Dan Larhammar (former Chairman of VoF), declined to be interviewed and wrote that the film was angled even before production had commenced. A system rotten to the core which can be compared with the Greek myth about the many-headed Hydra, which, from its home in the swamp, poisons the world with its breath and spreads terror and death. Peratt can be likened to a modern day Hercules; as Hercules destroyed the Hydra by cutting off its heads one after another, so Peratt is exposing and destroying the many facets of corruption shown in this film. The accusations which led to the revoking of Dr Enby’s licence to practice are brought into the light of day; all these accusations are shown to lack factual basis and are exposed as groundless. • – Thank you Börje, for a forceful and important film! You were brilliant in the interviews, particularly with those reluctant or unable to respond. • – The film was a powerful experience; this was particularly noticeable in the responses from the audience. • – I must repeat: I am incredibly, incredibly, incredibly impressed by you and your team!!! The film you have produced is a master piece; all those involved can be justifiably proud of their contributions! • – 10 years of harassment, licence revoked, media witch-hunt, police raid, 19 months of investigation (abandoned), a complete lack of interest in Dr Enby’s knowledge and experience analysing blood for causes of illness. Then his wife Gunnel dies, the one for whom he fought (polio) all those years. Saw the film yesterday – ANGRY!!!! • – Who is this Dan Larhammar who was able to initiate and remain the driving force behind a media witch-hunt of Dr Enby for more than 10 years? To get the media, including 18 journalists at Expressen, to dance to his tune? Who used falsified data, manipulation of grieving relatives and grave distortion of events, which led to the revoking of Dr Enby’s licence? Who is, apparently, behind slanderous statements in radio programmes where journalists fail to check their sources to establish the truth? How can ”Kropp och själ” (Body and Soul) (April 2014) broadcast serious inaccuracies, later used to justify a police raid, where a computer and patient records were ceased and the arrest of Dr Enby on Christmas Day! AND the Socialstyrelsen (The National Board of Health and Welfare), IVO (Health and Social Care Inspectorate) and HSAN (The Medical Responsibility Board)! It is wonderful to get all this exposed and explained. Thank you Börje Peratt! • – I bow my head to you. You really are the Orson Wells of documentaries – meticulous, accurate, dramatically correct, while at the same time to the point, dramatic and exciting! It is an honour to have been present at this premier and to be able to witness some of Erik’s fantastic life, the joys and sorrows. I do hope that one day he gets the recognition he deserves. • The film includes dramatised reconstructions of the life and love-story of Erik and Gunnel Enby. It shows Dr Enby’s research, the resistance he faced, together with face-to-face interviews and recorded telephone conversations. Several interviews were conducted with patients suffering chronic illness, some declared to be hopeless cases but who had improved or even recovered. In addition, there are conversations with other doctors, journalists, lawyers and representatives of various authorities, all of whom had been involved in the persecution and ostracising of Dr Enby. • It was simply love that led to Erik Enby’s decision to become a doctor and the driving force in his life-long research into chronic disease. In his teens, Erik attends a function at Svenska Kyrkan (the Swedish church) and we witness the beautiful moment when the couple’s eyes first meet and love blossoms. A few months later, 16-year-old Gunnel is paralysed with polio. Despite this, their love survives, leading to marriage and a son. At the end of the film we are once again in church, where Erik says his moving farewells to his beloved Gunnel, whose life ended in early 2016 after almost 60 years together. The final scene takes us back to the moment when, as teenagers, their eyes first met. The circle is complete. Love conquers all. Not a dry eye in the house. • The aim of the film is two-fold – firstly to present Dr Enby, his research and career as a doctor, together with the slanders and calumnies he endured. • A considerable amount has already been written about Dr Enby’s research and life’s mission in Humanism och Kunskap (Humanism and Knowledge) and also in NewsVoice. I want to mention one section of the film which I found particularly interesting. It seems that, in over 30 years of research, Dr Enby has discovered that unknown microbial lifeforms such as parasites and fungi multiply in body fluids and tissue and move throughout the body via the blood, causing infections and chronic illness. • He had only managed to get two drops of blood – legitimately. Following this event, Dr Enby continued his own research. • In April 1994, Dr Enby lectures on blood infections and leads workshops on the subject at the first World Cancer congress at Darling Harbour in Sydney, Australia, where he receives appreciation and acknowledgement of immunologists. Later, Dr Enby is visited by a woman from the USA. She has a large open wound from underlying breast cancer, from which Dr Enby extracts a sample; a video-recording of the procedure is made (1994). Microscopic examination shows that the sample is swarming with micro-organisms, which seem to be mycotic. Dr Enby is interested but needs more samples; however, he is refused permission to obtain samples in Sweden. An Indian colleague, Dr R S Couhan, who had come from the UN to study Dr Enby’s research, travels back to Madras and returns with a small suitcase filled with samples from cancer tumours. Under the microscope, all the samples turn out to be teeming with the same type of micro-organisms. They write an abstract for the 14th World Congress of Gynaecology and Obstetrics in Montreal in September 1994, to which they travel. The presentation takes place but no comments are made and nothing is reported in the papers. No-one dares speak up in a field where the pharmaceutical industries have the monopoly. Dr Enby’s research and repeated successful treatments with vitamins and minerals constitute a threat. And what would be the future for blood transfusions? • All subsequent attempts at research in Sweden have been stopped. As recently as 2016, Professor Mats Wahlgren (Karolinska Institutet, Stockholm) belittles and dismisses Dr Enby’s discoveries, stating that his approach is not scientific. This is years after Dr Enby had been authorised to carry out research on his discoveries relating to blood. Journalist and editor Karl Beijbom states that a scientific approach implies being prepared to listen to all aspects and theories of science, and to accept the results. Sadly, the medical establishment shows no interest, an indication of a less-than-scientific standpoint. • Peratt sought an interview with Professor Milan Stehlik, who is a European colleague with a positive view of Dr Enby’s research. However, Stehlik was silenced by this many-headed “Hydra” and so declined an interview, despite having previously agreed. Anyone should have the right to carry out research and test their methodology, particularly as similar research has been carried out in other countries. But… in Sweden Dr Enby’s research has been blocked at every turn. • Dr Erik Enby was licenced and has spent his entire working life in Gothenburg until his retirement in 2004. In 2001, Professor Dan Larhammar (then Chairman of VoF) commences what became an on-going witch-hunt against Dr Enby. On 7th December 2005, there is a synchronised attack from three directions: a campaign against “the quack Enby” on the VoF Forum, an article by Professor Larhammar in Expressen “It is deeply unethical” as well as an article about the fatally ill Siv who had died. In 2006, the witch-hunt continues with a further frontal attack against Erik Enby. TV3 and Robert Aschberg send a “false patient,” a woman who says she suffers from breast cancer, to see Dr Enby. For over two hours, she tries to convince him of the diagnosis but without success. In 2006, 58 papers launch further persecution of Dr Enby, accusing him of being a fake and blaming Dr Enby for the death of a woman who had committed suicide – a year after visiting him. In all, the woman had been to 12 different doctors for her breast cancer, refusing any hospital treatment. Having been diagnosed 14 months earlier, she came to Dr Enby, who urged her to have surgery. He signed a “sick note” for her, which her father later alleged was a certificate confirming her good health. The media, fuelling the witch-hunt, used the father’s statement without any attempts to verify its accuracy. The following year, 2007, after his retirement, Dr Enby had his licence revoked. • During the making of the film, Börje Peratt conducts an interview with the prosecutor Johan Udén in Gothenburg, who refuses to answer any questions. It is likely that, because of his position as a lawyer, he is not allowed to comment. A reconstruction of the police raid, which Udén had authorised, is posted on Youtube. Two weeks later, the investigation is abandoned. However, Dr Enby has still not had his licence re-instated. • The next screening of the film will be in the evening, this time in Gothenburg 2nd June at Bio Roy at 18.00. It looks likely it will be a full house. A journalist, who contributed to a book about Dr Erik Enby, contacted me several times to persuade me to make a movie about this man. I refused on several grounds, one being that I didn’t have the time. I was also concerned about what an investigative journalist might uncover, leading to me getting involved in something that would be mentally and emotionally stressful and to distractful for my main film projects. So I asked the journalist, Ulla Premmert, to summarize the key points on which I could make a decision. She said this was not possible, giving me a reason to say no. Then the summary arrived (on a single page!) totally removing my objections. So now I needed further information to investigate different views. Strangely enough, I could find no entry of Dr Enby in the Swedish Wikipedia but there was something in the English version. However, it seemed poorly constructed. To find out more about the knowledge of the general public, I created a Swedish Wikipedia page. This may be a way to get useful facts from other. It was immediately taken down and this was before 7 am! I challenged the violation of Wikipedia’s policy and the article was reintroduced. Soon after, it was attacked by several sceptics; I then realised that there were a number of peculiar motives behind the persecution of Dr Enby. During this exchange with Wikipedia I took the decision: a documentary is required. My opposition to these “guerrilla tactics” by sceptics led to them blocking me; this was in summer of 2015. Wikipedia was clearly contaminated by or in the hands of the sceptics’ movement. The first person I wanted to interview was Professor Dan Larhammar who seemed to be central to the criticizm of Dr Enby, and thus very important to listen to. Dan Larhammar is used to being interviewed on radio and television but refused to be interviewed by me. What was he afraid of? Instead, he wrote an article stating that the movie was biased in favour of Dr Enby – even before production had begun! If he considered in advance that the film was biased, now he had the opportunity to present his point of view. Did he sense that I would see through him? I searched all that he had written and the recordings of his statements about Dr Enby and secured that I was given permission to use them in the upcoming documentary. I found no grounds for Larhammar’s statements, instead they were what we today would call “fake news.” How could Swedish media release these slanders without checking the facts? That was the next task – interview my colleagues. Yes, this could be perceived as cross-examination. Other doctors and researchers critical of Dr Enby were also interviewed. It would then be up to the audience to decide what was fact or fiction. The story grew, becoming more than double the originally-planned time of 45 minutes. It had now reached 100 minutes, with much essential information remaining. In the end, I managed to cut it to 1 hour 52 minutes. Would the audience cope with such a long documentary? One of Sweden’s largest TV channels, TV4, offered to show the movie in two parts. It did not feel right and I decided on a sneak preview at 3 pm in a cinema in Stockholm, to which journalists were invited. Not many journalists showed up; however, a large paying audience did. It felt like a blockbuster! The reaction was overwhelming. With renewed confidence following the audience’s positive response, we had growing expectations for the premiere at a large cinema in Gothenburg. The cinema was sold out, one row being taken by sceptics who tried to disturb the screening. They failed. Subsequent screenings were also fully booked. The film has now been shown in cinemas all over the country for over a year.